Baton Rouge, LA - The DRM-084 series is a rugged rack mount LCD designed for COTS military applications but is a suitable solution for many other industrial environments. 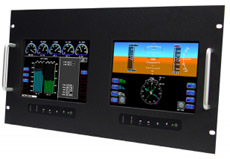 Occupying only 4 rack units (4U) of a standard EIA RS310 C – 19” equipment rack, yet having two high resolution 8.4” LCD screens with completely independent OSD controls and video inputs. The DRM-084 provides image reproduction that exceeds all other displays available in a similar mechanical form factor. This rugged and reliable COTS dual LCD display is engineered for the most demanding environments. Each 8.4” LCD offers 450 nits (cd/m2) brightness, and an Optically Bonded Anti-Reflective Protective Window or Touch Screen for superior optical performance and better protection throughout extreme environments. The system boasts a very wide operational temperature range of -30°C to +85°C (-22°F to 183°F). Each 8.4” TFT-LCD features a true Industrial Grade LCD, wide viewing angles of 80R/80L – 80U/60D, Picture-in-Picture (PiP) and Picture-Outside-Picture (PoP) support, as well as Solid State LED long-life backlighting. The rugged design continues with a front bezel which is fabricated from high-grade heavy-duty aluminum and the rear chassis is produced from cold-rolled steel which increases the strength of the finished product through the use of strain hardening by as much as 20 percent. The DRM-084 is capable of operating with not only the latest controllers but also various legacy video formats through its unique internal signal recognition system. This model is also feature-rich with various configuration options for specific applications including high-brightness sunlight readability technology (1500 nits), various AC & DC power inputs, conformal coating of all internal circuit boards, various touch screen technologies, an assortment of computer and/or video input connections, 3-buffered unity gain BNC outputs, and even wireless remote controls.